We got head colds right before Thanksgiving, so we took it easy for a few days and did not get out for Thanksgiving. =( Oh well, did not feel up to it anyway! Did manage to cook us a turkey and gressing and greenbean cassarole though! I also made up some of my new tea to try! It was SOOO good! I think it is some of the best tasting herbal tea I have ever tried! 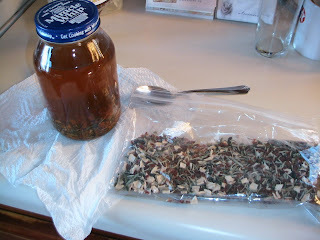 The tea is called "Cold Season Immune" and it is one of Dr. Christopher's formulas, of course! You can read about it Here, but I highly recommend buying THIS book, so you can make the tea yourself (and tons of other formulas, etc)! The book may be around $70, but it is really worth it! This tea is full of vitamin C! And is great for fighting infections. I hope you get a chance to make this tea and try it!